Where taking care of you is at the heart of all that we do. Here at Walsall Mind and Body Centre we pride ourselves on the quality of our service, the professionalism of our staff, and the range of our treatments. As Walsall’s premier provider of complementary therapy, and natural and holistic healthcare services, we combine mainstream medical treatments such as Physiotherapy and Clinical Psychotherapy with Complementary, holistic and natural healthcare option to act as a hub for all your wellbeing needs. Languages spoken at the Centre include: English, Urdu, Punjabi, Chinese (Haka), and Makaton. If you need to speak to us in one of these language please Text the name of the language from the list above to 07495893708 and we will contact you as soon as we are able in the language you have requested. We are located in the row of shops between the Broadway Coop Store (at the junction of The Broadway and Hawes Road) and the Fullbrook Pub (on the junction of Westbromwich Road and The Broadway) in a Parade of shops which is called Hawes Close. Our front door is next to Broadway Pharmacy, we have a large banner sign upstairs above the sign for the pharmacy. There as ample free parking in the car park at the front, also at the adjacent Coop store. Further parking can be found in Hawes Road which is very close by, as a turning off The Broadway. 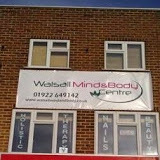 Walsall Mind and Body is a family run business providing the widest range of holistic health services anywhere in the Black Country. A visit to our premises will assure you that we can offer a private, relaxing and confidential location, which enables you to start to relax the moment you step through the door. Because our premises are not fully accessible, we suggest clients with mobility difficulties ring before you visit so that we can discuss your requirements. Under certain circumstances a home visit may be available.